The Body Shop's Vitamin C Microdermabrasion was purchased very much on a whim at the #TBSXmasBonanza back in December; I only opened it mid-May as I'd wanted to finish my previous exfoliating product off before opening another, but have since been using Microdermabrasion in the shower every other day. The packaging tells us this product provides, "Weekly home-spa exfoliation. With Vitamin C-rich Amazonian Camu Camu and Community Trade Shea Butter." According to The Body Shop's website, "Fine exfoliating micro-particles and crushed garnet stones remove dead skin cells to reveal a brighter, more radiant complexion. Removes dead skin cells, leaves skin feeling soft and smooth, gives skin a brighter, more radiant look, improves skin texture and tone." I always exfoliate in the shower as I find this the easiest way of ensuring I don't have exfoliating particles left stuck to my skin afterwards. I've been using Vitamin C Microdermabrasion by squeezing a large-pea-sized-amount onto my fingertips and massaging with a circular motion onto my skin, focussing on my nose, chin and forehead, as these are the areas which tend to get the most congested. The product is opaque and white in colour, with super-fine exfoliating particles which don't feel harsh on the skin at all, but still feel like they're doing what they're supposed to. The scent is beautiful, really fresh and citrussy, which makes this a pleasure to use and is ideal for waking you up of a morning! 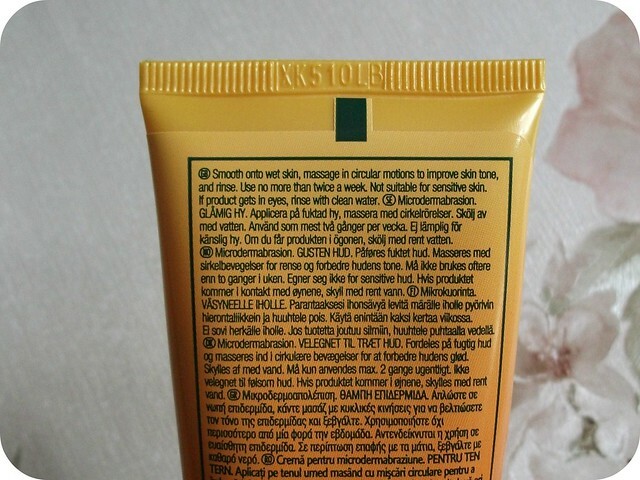 The packaging suggests using no more than twice a week, but I have to admit I've been using it a little more often than that (three or four times per week), as my oily skin tends to become dull and congested quite quickly; if you have drier or more sensitive skin, I'd definitely recommend sticking to just once per week as suggested! I do agree with The Body Shop's suggestions that this wouldn't be suitable for extremely sensitive skin, so if that's you I'd recommend steering clear. Personally, though, I've really enjoyed using the Vitamin C Microdermabrasion so far, with my skin feeling much smoother and softer and looking brighter and healthier after use. I've found I have fewer blackheads around my chin and nose, and the little under-the-skin bumps I had on my cheeks are also greatly reduced, so I'm hopeful that with time they'll go away altogether - a girl can dream, eh!? The Body Shop Vitamin C Microdermabrasion is available in-store and online from The Body Shop, priced at £13 for 75ml. It does sound pricey for such a small tube, but a little really does go a long way (I use literally half as much as I was using with my previous St Ives scrub), and if you look out for one of The Body Shop's frequent offers I'm sure you'd be able to grab a bargain! I actually mentioned this in my recent Summer Favourites post, which should tell you how much I'm loving it; I can definitely see myself re-purchasing once I've finished this tube as it basically does everything I want an exfoliator to do for me. 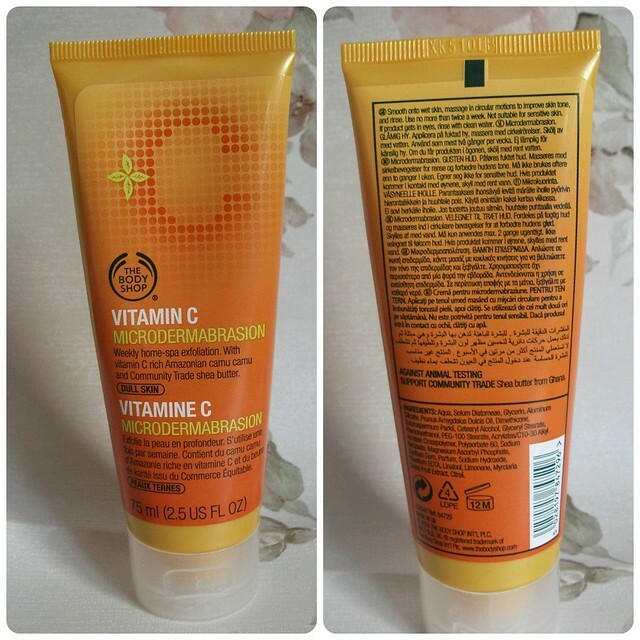 Have you tried The Body Shop's Vitamin C Microdermabrasion, or any other products from the Vitamin C range? How often do you exfoliate? This sounds lovely I didn't even know this product existed!! This sounds great! :) I love Body Shop skincare, but I haven't tried it before. I love The Body Shop's Vitamin C Microdermabrasion scrub. I have been using it a year now and don't have any blackheads or whiteheads any more. Usually scrub around once a week. Lovely review. Thank you for visiting my blog. PS - Do you want to follow each other?